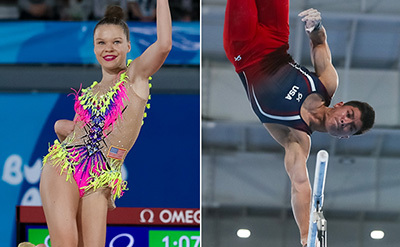 BUENOS AIRES, Argentina, Oct. 9, 2018 – Rhythmic gymnast Elizabeth Kapitonova of Staten Island, N.Y./Isadora, and Brandon Briones of Gilbert, Ariz./Aspire Kids Sports Center, will both compete on the final day of gymnastics qualifications at the 2018 Youth Olympic Games in Buenos Aires, Argentina. Gymnastics’ qualification round wraps up tomorrow with men’s and rhythmic gymnastics. The medals for the multi-disciplinary event will be awarded at the conclusion of the evening session. Live scoring and results are available through the official website. The live stream of gymnastics coverage on the Olympic Channel begins on Oct. 11 with the men’s all-around finals. Kapitonova will compete at 2 p.m. in clubs and at 7 p.m. in ribbon in the all-around qualification round. Briones competes in men’s final event, the horizontal bar, at 7 p.m. Times are local to Argentina. In rhythmic’s all-around qualification, Kapitonova earned a 14.600 for hoop and a 14.350 for ball routine for a two-event total of 28.950 and 13th. Russia’s Daria Trubnikova had the highest all-around score after two of four events at 35.175. Ukraine’s Khrystyna Pohrankychna posted a 32.350, and Armenia’s Yulia Vodopyanova in third at 32.150. In the parallel bars qualification round, Briones scored a 13.266 (4.700, difficulty; 8.566, execution) for 10th in the preliminary ranking. Japan’s Takeru Kitazono had the highest event qualifying score at 14.266, followed by Russia’s Sergei Naidin (13.933) and Ukraine’s Nazar Chepurnyi (13.833). For the women’s uneven bars Giorgia Villa of Italy posted the day’s top score at 14.100. Anastasiia Bachynska of Ukraine was second at 13.466, and China’s Tang Xijing was third (13.333). 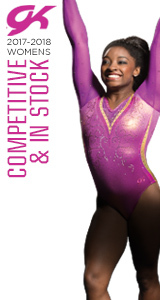 In the multi-discipline event, gymnasts are divided into multi-national teams. Each team includes one mixed pair, acrobatic gymnastics; three men and three women, artistic gymnastics; three rhythmic gymnasts; and one man and one woman trampoline gymnasts. Multi-discipline event scoring adds the rank achieved by each gymnast/mixed pair in their respective disciplines. The team with the lowest score wins.